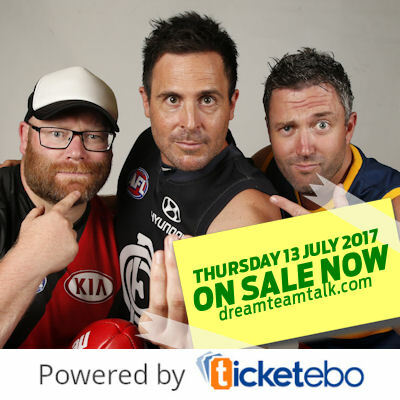 Roy, Calvin and Warnie are coming back to WA for a live show on Thursday 13 July. After a fun trip over to WA back in 2013, DT Talk is making their way to Perth once again for a special live show ahead of the round 17 Fremantle v West Coast Derby. Roy, Calvin and Warnie will be doing what they do best – drinking beer and talking AFL Fantasy. As the business end of the season approaches with finals on the horizon, the three lads from Tassie will preview the round, discuss the fantasy things you need to know, share stories, answer questions and a whole heap more in what is set to be a great evening for fantasy footy fans. They also will be joined by special guests for a ripping night full of banter and insightful fantasy talk. There will be giveaways and drink specials during the evening. Doors open 6:30pm, live show starts at 7:30pm. The exclusive WA stubby holder ticket offer is available up until 11 June. It is unlikely any will be available to purchase on the night. Join the boys for some froffies and plenty of oinking as DT Talk returns to Perth for what will be the start to an epic weekend! PLEASE NOTE: This event is intended for an 18+ audience. We are very pleased to be offering the ability to buy your tickets online. We have partnered with the secure online ticketing services of Ticketebo for the provision of our tickets. Buy online today by clicking here. What about if I live in Sydney, but I’m from WA, and I just want to buy the wicked limited edition Stubby Holder? very late on the update! would have been there for sure living in subiaco! You are allowed to attend with a parent/guardian. what about if under 18 but have mates that are 18+??? Who do u think for capatain Rory or abblett ..
Will you ever do an Adelaide one?